Construction work is a vital and often underappreciated sector of a robust American economy. It is hard, complex and sometimes dangerous work, but your employer may not offer any benefits or aid if you are injured on the job. How are you to get by without income? How will you recover as quick as possible if you are unable to pay medical bills or for rehabilitation? At Babbitt & Johnson P.A., we help construction workers who have been injured on the job discover their legal options in seeking benefits. Our West Palm Beach construction accident attorneys take the time to gain a full understanding of your situation and the facts. We investigate your claim, determine who is responsible and hold them accountable. Depending on the negligence that led to your injury, we may be able to pursue compensation from a subcontractor, general contractor, property owner, machinery manufacturer or other party. When we take on your case, we handle all aspects of your case. We keep you informed throughout the process, but we ensure every aspect is properly and efficiently executed from the beginning of the investigation, to filing the claim, to negotiation and/or litigation to enforcing payment. We proceed in your best interests to provide for your best possible recovery. Injuries resulting from a crane accident are often catastrophic and sometimes deadly. At Babbitt & Johnson P.A., in West Palm Beach, we take these injury cases seriously and provide our clients with full attention to every detail of an independent investigation, establishing the source of negligence, preparing a solid case and fighting for the maximum compensation they deserve. Cranes are dangerous for operators, nearby workers and even passersby. If you or a loved one has been injured in connection with a crane accident, you deserve legal help that can provide you personalized service, peace of mind and careful assessment of your case. 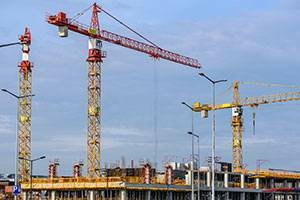 Our West Palm Beach crane accident attorneys provide quick response and attentive care to construction workers, highway workers and others who have been injured on the job, or who may have just been passing by at the time of the accident. We take the time to gain a full understanding of the facts of your situation. We will examine the responsibilities held by subcontractors, general contractors, property owners, machinery manufacturer or third party. If you have been seriously injured on scaffolding at a construction site, experienced legal counsel can work to your advantage. Serious injuries can be traumatic, and they can be life altering. Initially, it may seem like you will recover quickly, but it might take awhile to get in the condition necessary to get back on the job and begin earning income again. Your employer might even be cautious of allowing you to do the same work again if you have been injured before. Workers’ compensation may be available from your employer, but even if it is, it might not cover all the medical, rehabilitation and income losses you have incurred over the course of your recovery. The sooner you contact one of our knowledgeable lawyers, the quicker we can get to work investigating your case. From offices in West Palm Beach, we advise all our clients and keep them informed through every step of claim investigation, case preparation, negotiation and/or litigation. Accidents involving scaffolding can be complex to put together. Establishing liability and responsibility for a fall, an impalement or a falling object requires the work of an experienced legal professional. Our Palm Beach County scaffolding accident attorneys hold negligent parties accountable for your injury. We will fully investigate your claim on a contingency fee basis and determine whether the negligence of a subcontractor, general contractor, property owner, manufacturer or other party can be proven in court. Have you been seriously injured in a fall on a construction site or during a renovation? Working on roofs, ladders or scaffolding, you are really putting your life in someone else’s hands. Improper setup of a ladder or scaffolding, a roof collapse or a wall giving way could lead to a serious fall and a potentially life-altering injury. At Babbitt & Johnson P.A., we help our clients seek the benefits they deserve through any applicable workers’ compensation insurance and pursue recovery from negligent parties. It is critical to speak with an experienced attorney before accepting benefits to gain a full understanding of your legal options. An underlying personal injury claim may have greater potential for covering the costs you may incur as you recover from serious injury. Our West Palm Beach ladder and roof accident lawyers will fully investigate your claim, guide you through the legal process in an informed manner and pursue your maximum compensation to cover medical expenses, rehabilitation costs and income losses you have incurred over the course of your recovery and that you could potentially encounter in the future. The sooner you contact us, the sooner we can get to work on your behalf. Call us today to understand the full extent of your legal options and opportunity. On any job site, any number of power tools and machinery could be used over the course of a construction project. With any number of subcontractors using their own tools and machinery, it’s impossible to be sure if each piece of equipment has been properly maintained, sure of its quality manufacture or sure of safety measures built into the product. When powerful tools or heavy machinery have defects or do not operate as they should, severe and sometimes fatal injuries can result. If you or a loved one has been seriously or fatally injured on the work site, it is important to consult with an experienced attorney as soon as possible. The West Palm Beach, Florida, unsafe and defective machinery attorneys at Babbitt & Johnson P.A., can provide you with full, attentive service in any construction accident injury. We seek the benefits our clients deserve through workers’ compensation insurance and/or pursue personal injury recovery from negligent parties if necessary. Your best interests drive your legal strategy at our law firm. We will help you understand the legal process, your legal options and the full potential value of your case. An underlying personal injury claim may provide for greater coverage of your costs relating to your recovery, medical expenses and lost wages. We keep you informed throughout the process and let you make the decisions. Our attorneys have experience handling a variety of product liability cases involving unsafe and defective machinery, including bulldozers, forklifts, bobcats, cranes, power tools, saws, ladders, scaffolding and many others. Electrocutions and explosions are more likely on some work sites than others, but if you or a loved one has been seriously injured, it is important to know that you have strong representation of your best interests. With the right, aggressive representation, you can ensure that you receive the full workers’ compensation benefits you deserve and that your incident will be fully investigated to determine if negligence played a role in the accident. Our award-winning personal injury attorneys represent the rights of the injured, and we have been doing so with a passion for justice for decades. Our West Palm Beach electrocution and explosion attorneys work diligently to examine every possible cause of the accident that caused your injury. We collect, document and preserve evidence to build a case for your maximum compensation, and we fight for your rights through every step of the legal process. Serious and sometimes lifelong burn injuries can result from electrocutions and explosions. Burns might be so serious that they require surgery and therapy for the long term. You might require several medical procedures over the course of your recovery, which could be several months or years. It is critical to consult with a knowledgeable and resourceful attorney as soon as possible in order to evaluate the full value of your injuries rather than accepting an insurance settlement, no matter how tempting, that might not cover your expenses. If you or a loved one has been injured on a construction site, contact the lawyers at Babbitt & Johnson P.A. Call us for a free initial consultation toll free at 1-888-666-0523. We are dedicated to ensuring your rights are protected.